Air ducts are more important than people realize. They’re responsible for channeling clean air through houses, commercial buildings, and many other environments. Breathing problems are aggravated by dirty ducts, where debris and dust is redistributed through the spaces they’re present in. This is a huge incentive to get your air ducts cleaned, but why should you use a professional before summer arrives? My Ducts Aren’t Working Properly! This is the last thing you want to experience during the hot summer months. Temperatures rise, and you’ll want maximum system efficiency to sufficiently cool your living environment. In order to get the cool environment you desire during hot weather, all dust and debris should be removed from your ducts in advance. When dust from your system circulates around a room, it can settle and make things dirty. Cleaning shouldn’t be more of a chore than it needs to be during summer months, where a room caked in dust is highly undesirable. Rather than reacting to messy conditions, use professional cleanings wisely to prevent the issue before it arises. Vermin are a big nuisance, and infestations are a big headache come summer time. 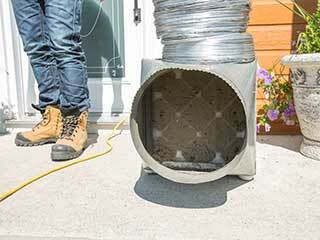 Air duct cleaning is a great solution to this problem, helping your home become safe from unwelcome critters. Hot temperatures create breeding grounds for mold, so if there is any indication of mold in the winter months, you’re best to attend to it sooner rather than later. If mold isn’t visible, that doesn’t mean it isn’t there, so to safeguard against this outcome, employ a professional to attend to your cleaning needs. Hopefully you have found this article informative, and have a better understanding of why you should get your air ducts cleaned this summer. If you have any questions, please contact our experts and we’ll get back to you in due time.